This is not one to miss out on. 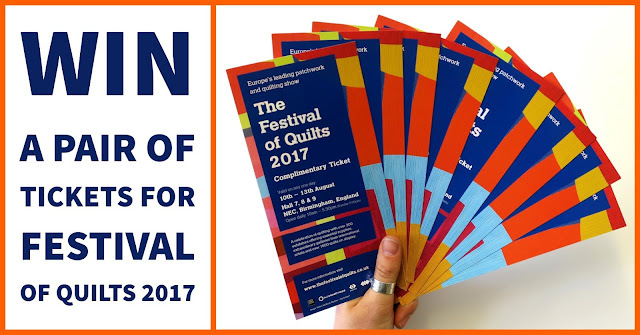 We have 9 pairs of tickets for the Festival of Quilts 2017 to give away, so tell all your creative buddies and get entering! All you have to do to enter is vote for your favourite quilt from Kaffe Fassett’s new book ‘Quilts in Ireland’, enter your details and boom, you’re in! Entries for the giveaway close at 12pm on Friday 28th July and we will be announcing the winners on Facebook, so be sure to like our page to be in the know. Share with all of your creative friends and even if you don’t win, maybe one of them will get lucky and take you along! Don’t forget to sign up to our email newsletter whilst you’re there to receive exclusive deals and hear about all our new product first. If you are LOVING the quilts you are seeing from Kaffe’s new book, find out more about how you can pre-order the book and save on quilt kits here! If you’ve already got your tickets to Festival, read this post for all the details on what to see on the Cotton Patch stand.